China's Air Pollution Is Prompting Middle Class Activism : Parallels Severe air pollution in China has forced some city-dwellers, especially parents, to respond in ways that would have seemed unthinkable in the past. Some are moving elsewhere; others turn to activism. Pollution has driven some families to leave Beijing. A group of Chinese lawyers is suing the governments of Beijing and its surrounding areas for not doing enough to get rid of the smog. In recent winters, severe smog has blanketed northern China with a grim regularity, triggering emergency measures in scores of cities. What has been changing in recent years is how some ordinary Chinese citizens, particularly those in the growing middle class — who have the means to take action — have chosen to respond to the pollution. Lan Yanfei, a Beijing resident, made her choice in 2013. She decided to flee. Her 3-year-old son got sick several times that year, each time during a period of heavy smog. Lan says she decided to put her son's health first, although it meant sacrificing career, education and other prospects and resources in which Beijing has a clear advantage over the rest of the country. "I felt it was very unsafe for me to leave my child in that environment," she says. "He's still so young, his body is still growing and the harm the pollution does to him may be irreparable." Lan and her family moved first to Yunnan Province in the southwest, and later to Shenzhen city in the south, both of which have better air quality than Beijing. Her son doesn't need to wear a mask to guard against pollution in Shenzhen. She says she feels strongly that her family made the right choice. "Frankly, it's because I had no confidence that Beijing could clean up its smog," she explains, "even in 20 or 30 years." In fact, on average, air quality in China's urban areas has been improving. The country's coal consumption fell last year for the third year in a row, while the use of renewable energy sources increased. But air pollution in north China during November and December was worse than during the same period in 2015 — driving many middle class families to respond, or at least consider what to do. Lan Yanfei was interviewed for a December report in The Paper, a Shanghai-based, state-run media outlet, focusing on three mothers from Beijing and surrounding areas and the choices they'd made to deal with air pollution: One mother barricaded her family in their home and cranked up the air purifiers. Another organized other parents to test air quality in public places and publish the results online to raise awareness. The report caused quite a stir before government censors erased it from the Internet. Some readers compared the piece to Under The Dome, a 2015 online investigative documentary about Chinese pollution by former state television reporter and anchor Chai Jing. That film was viewed 200 million times and was praised by China's environment minister — before it, too, was censored. "How are we going to clean up the pollution," Lan Yanfei says, "when we're not even allowed to talk about it?" Not everyone has been silenced. One Beijing father, Shen Kui, says the pollution was making his child sick and his wife depressed. He recently filed a freedom of information request to find out exactly what was causing the pollution. "As a father, I felt I had to take responsibility and do something, do what I could to help clean up the smog," he says. Shen acted as both a father and a scholar. He teaches law at Beijing University. "I felt I should put my teaching into action, file this request, and through it, push our government to be more transparent and accountable," he says. Specifically, Shen wanted to know how much the burning of petroleum coke, a highly polluting fuel, is contributing to Beijing's smog. The government's answer: not much. Shen takes some comfort from the fact that the government responded to his request within the time specified by Chinese law, but he wants to see the government release more information in the future. Next, he would like China's legislature to form a special committee to investigate the problem of pollution, but that's a power China's legislature, the National People's Congress, has never used. 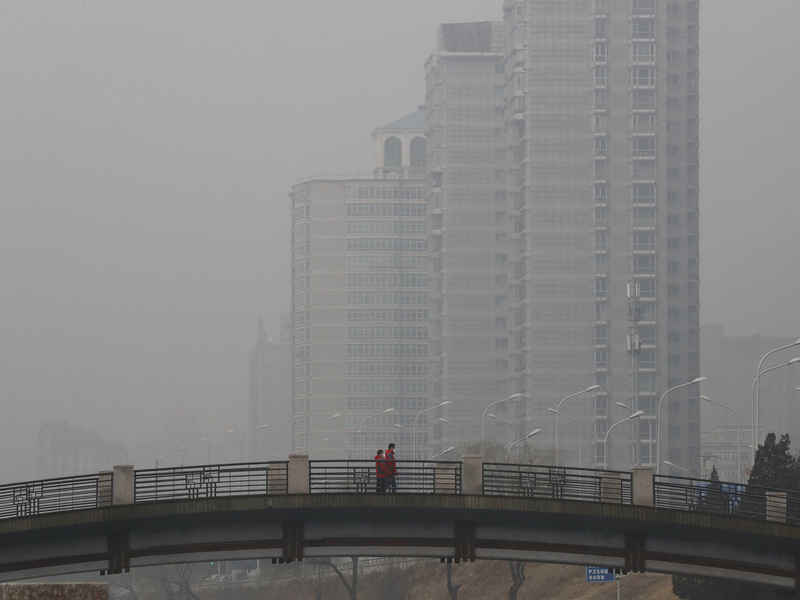 Meanwhile, some Chinese lawyers are suing Beijing authorities for damages related to pollution. Earlier, several human rights lawyers had brought lawsuits against local governments in northern China for failing to effectively manage pollution, but the courts refused to hear their cases. All this might seem to suggest there's not much that ordinary Chinese can do about the situation. Middle class Chinese, says independent analyst Wu Qiang, "have discovered that they lack channels for political participation and expression. They can't get out of their predicament, so they're expressing a sort of political anxiety." But, Wu says, their words and actions are in fact having an impact. They're already putting a lot of pressure on the government. "We can see that the government is very nervous about smog, and about the rising power of the middle class," he says. Wu points out that in December, mostly middle class residents protested smog in the streets of Chengdu, in the southwest. This made police there so nervous that they started detaining anyone wearing a face mask on a smoggy day. Middle class angst has spread to other issues, too, Wu says. Citizens were outraged about apparent police brutality in the death of Lei Yang, a young environmentalist who died in police custody in Beijing last May. Despite petitions calling for justice, signed by thousands of elite university graduates, no charges were brought against the officers involved in Lei's death. Wu observes that urban, middle-class Chinese families are especially fragile and vulnerable to a range of threats, including pollution, because for nearly four decades, the government has limited them to just one child. This is, of course, true of lower-income families, too. Besides being less aware of smog's health threats and having fewer resources to protect themselves, lower-income residents often say they are too preoccupied with simple economic survival to respond with protests or other actions. As for Lan Yanfei, the mother who left Beijing for her son's health, she says the only thing she regrets about her decision to uproot her family is that she can't yet properly explain it to her child. "I hope that when he grows up," she says, "my son won't blame me for taking him away from Beijing, because to a mother's mind, her child's health always comes first." At last week's ceremonial meeting of Chinese legislators, Li Keqiang, the country's premier, promised: "We will make our skies blue again." Lan's hope is that parents like her can break free of the smog and see blue skies.